Posted by Hughes Group Blog Team on Saturday, January 12th, 2019 at 3:55pm. Don’t let the aesthetics of a crackling wood fire fool you – despite the usefulness of a preexisting wood-heating system in your home, the installation of a new one can run your household thousands of dollars, and the maintenance of one that does exist can also be expensive. In order to judge whether or not you think you would be able to handle such a system, check out the pros and cons list below. 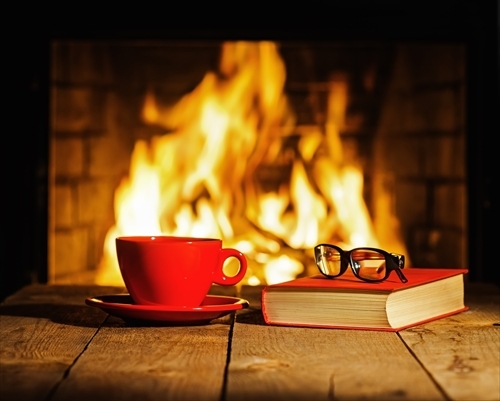 From a purely practical standpoint, wood-burning heating systems can’t be beaten on the fuel they use. Wood, compared to other fuels like oil, gas, and coal, has a much lower net fuel cost, due to having a fairly standardized price as well as being widely available in the form of logs, wood chips, and lumber waste. Furthermore, wood is completely biodegradable, so unlike other types of fuel, wood releases fewer toxic pollutants into the atmosphere when burned. And wood does not require electricity to burn, which could be very valuable should there be a power shortage in your neighborhood. Many wood-burning stoves utilize pellets, which are made from recycled materials and are compressed in order to reduce moisture content and thus, make them easier to burn. Far more efficient and less polluting than the traditional fireplace, wood pellets undergo strict environmental standards and are relatively carbon neutral by many environmentalists. A fireplace or stove can instantly make any room cozier and warmer. But perhaps what’s most ideal about this is it allows for zone heating or the heating of one area of the living space. Unlike typical heating system which works to warm the entirety of a house, which you may or may not be using, wood stoves in core rooms of a house allow homeowners to prevent wasting their money on heating areas that receive little traffic. And depending on the layout of your house and size of your stove, wood-burning systems can heat anywhere between 400 to 3000 square feet – meaning your zone heating plan can hit exactly the areas you want it to. In fact, if you’re interested in expanding your wood-burning heating feature to your central heating system, a wood-burning stove can be attached to your boiler in order to provide hot water throughout your home. This can, in the long run, reduce your carbon emission footprint and save you big money in monthly bills. Fireplaces, on the other hand, are horribly inefficient at providing heat for your room and should be avoided if you desire to expand on your home’s energy facilities. As mentioned before, it’s hard to argue with the image of a wood-burning stove or fireplace in your home, especially in such a temperate state. Often the focal point of any living space, these features provide warmth and comfort as well as function, and as a light source can set the mood for any social gathering when lit. Fireplaces evoke feelings of hominess and luxury in much of the public, and this is not only a benefit to interior design but your property value. According to a 2007 National Association of Realtors survey, a fireplace may increase the value of a home by thousands of dollars, depending on your location. Despite the smell of burning wood having grown to such popularity as to be a scent for candles and colognes, actual wood burning necessitates many hazards – and this isn’t only due to the fire itself. Burning wood releases hazardous gases like carbon monoxide and nitrogen oxide, and so any good fireplace or stove needs proper ventilation. Cleaning out ashes from your stove or fireplace will prevent this ventilation system from blowing hot ashes onto your living room rug. But the ventilation itself will also need to be inspected and cleaned regularly, to clear any potential blockages, as well as discover any trace of a sooty residue called creosote. Creosote, carbon compounds formed from wood resin and water vapor, is a black, tar-like residue, a condensation of combustion by-products that stick to the much cooler ventilation shafts after exiting the fire. It’s also highly combustible and can explode into fire over 2000°F. This and other hazards can be avoided, but only with proper maintenance of your fireplace or wood stove. The installation of a wood-burning heating system in your home may not only be hard on your wallet but also hard on your available living space. Because of the safety standards, these systems necessitate, such as the installation of ventilation shafts, a brand new heating system like this can force a bit of a living adjustment for the common household. Smaller heating systems, like a fire stove for a single room, may not create many inconveniences, but those meant to heat several rooms or the whole house will be more intricate and thus more of a hassle to install, as you’ll need to consider the insulation of your home and if the heat a stove will produce will actually save you any money. Furthermore, whether you're using logs, chips, or pellets, wood-burning heating systems require a steady supply of fuel in order to keep going. Comparably, pellets and chips take up much less space than logs, but the average stove will need quite a bit to maintain heating in your home. Furthermore, though logs can be unwieldy, they can survive the elements a lot easier than pellets do, and can be stored outside. Despite wood-burning heating systems being efficient in some ways, the overall cost of maintaining the fuel can be a lot for some homeowners. Wooden logs are far cheaper than pellets because unlike pellets, they do not require secondary production techniques. In more rural areas it’s even possible to find firewood on your own acreage. Wooden stoves and fireplaces perform much less efficiently than pellets, as pellet stoves produce 11.3 million BTUs (British Thermal Unit, the amount of work needed to raise the temperature of one pound of water by one degree Fahrenheit) per ton for a household to enjoy, compared to the 10.7 BTUs a stacked cord of firewood a wood stove can produce. And, pellet stoves are easier to clean. But most pellet stoves do require electricity to function, unlike wooden stoves and fireplaces. All in all, wood-burning heating systems come with a lot of give and take. If you’re interested in saving on your energy bill and can’t afford the long-term plot of installing wood-burning heating into your home, there are better alternatives. Making sure your attic is well insulated, using space heaters, putting fresh filters into your furnace, air sealing your home, or minimizing the use of vent fans can all knock your energy bills down. And if you don’t have a wood-burning feature in your home but would like the ambiance, electric fireplaces and wood-burning stoves are fully customizable and can go with any décor. Or for an even cheaper option, DVDs of fireplaces. Regardless of what you curl around to warm up this winter, whether it be wood stove or an electric blanket, make sure you spare a moment to consider how much you have invested in your heating system, and be sure that it’s right for you. It may be a winter wonderland outside, but you shouldn’t give your heating system the cold shoulder.